Self-powered, Convenient Mounting system for FLIR Boson on your DJI Mavic 2 (Zoom & Pro), Mavic AIR, Mavic Pro, Phantoms, Inspires..., Autel, Yuneec drone... with 5.8ghz video downlink and monitor. Easy snap on and off. Leave all DJI Mavic sensors clear to use. No extension legs needed. Make your drone have Dual Visions: Thermal and Visible. Won't block any of the DJI Sensors (front, rear, side, top AND downward)! With a quick mount, thermal mount VuIR Boson can be easily and quickly attached/removed: ideal for setting up for the job and unpacking for storing in the existing carrying case of backpack. All of this convenience makes it ideal for any type of job, from casual once-in-a-while to frequent constant thermal imaging works. It runs on its own rechargeable battery, no need to extract the power from the drone. No modifications to the drone needed = peace of mind on the drone warranty. It can be handheld or transferred to other drones or systems. Increased utility, reduced idle time: you'll get much more out of your investment. Future-proof protects your investment: if you need upgrading the drone, VuIR still functions. With our design, the Boson is mounted on top of the Mavic and thus will not affect any of the Sensors or GPS. This making flying indoor or outdoor with the Mavic/Mavic Air loaded with VuIR Boson is still easy as if nothing was added to it. Also no leg extensions are needed saving a lot deploying and packing up time. With its own Thermal Video monitor, you will have dual visions, thermal and visible (through the drone's camera), simultaneously. The HD visible live video from the Mavic/Mavic Air gives you visual aid for flying and help you make better sense of the VuIR thermal imaging in real time. The dual visions greatly enhance the efficiency of the inspection compared to when only thermal vision is used. Flight time of Mavic loaded with VuIR Boson and Boson camera: 20 minutes, and 13+ minutes for Mavic Air. Now works for Mavic 2 Zoom and Mavic 2 Pro. Flight time for these is longer than 20 minutes. Video Range: upto about 1 mile LOS (line of sight). 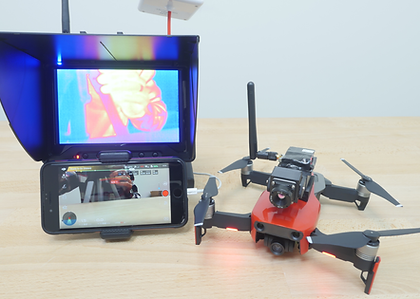 This allows user to mount both the Thermal monitor and a smart phone (up to the size of iPhone 8 Plus or similar) on the DJI controller for easy, one-person operations. We can ship 60 Hz cameras to certain other countries (see notes below) but it will require some additional documents before shipment. If you are in one of the countries below and would like a 60Hz camera email contact@groupgets.com . Otherwise all international orders will receive a 9Hz camera. I have just created the GroupGet for VuIR Boson - Fixed mount & Video system to integrate FLIR Boson on DJI Mavic Air/Mavic Pro and others!